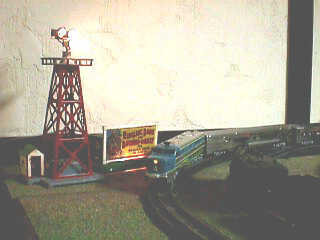 Photos of Paul Loehrer's American Flyer layout. Paul's chat nickname is Flyn, and is a regular at the Sunday night chat. 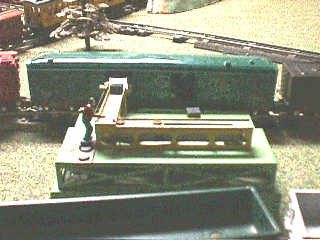 I first start with American Flyer Trains in 1963 when I received my first set for Christmas. It was the Casey Jones 21165, NYC Boxcar, Monon Gondola and caboose. They ran on pikemaster track attached to a 3x4 sheet of plywood. When I got a little older my dad would set up his K5358W Challenger Steam Freight Set. He purchased this set in 1953 when he was in charge of the Gimbels Train Department in Milwaukee, Wisc. at the age of 17. My brother and I along with "The Superintendent" (my dad) ran the trains into the mid seventies. They where stored until January 1996 (American Flyer's 50 anniversary in 3/16 'S') when we came across them while cleaning out my parents basement. It didn't take me long to get up the courage to ask my dad if I could "borrow" his set. Since then I have been collecting and operating AF. My current layout in 10' x 8' built "temporarily" on 1/4 in plywood supported by 2x3 studs. This layout enables me to run three trains at once. 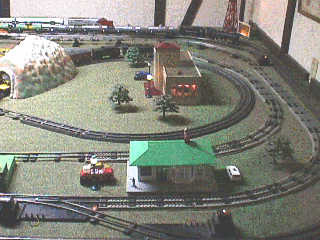 4 loops, 2 sidings and 1 stretch of track for a yard. 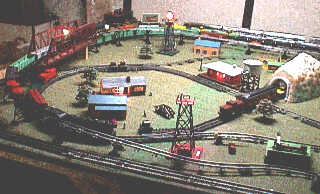 All loops are connected with switches enabling any train on any track to be switched to any track. The bridge looms over a portion of the switches connecting the figure 8 to the main line. The 769A Revolving Beacon can be seen in the background along with a 566 Whistling Billboard. The houses and trees are from an All Aboard set. The figure 8 winds around the Talking Union Station with the 23788 suburban station in the foreground. In the background is a 774 Floodlight Tower with a pre war Whistling Billboard (without whistle). The man on the 770 Loading Platform loads brand new reasonably priced American Flyer train sets into a 732 baggage car, while the man in the 732 unloads customer orders for brand new reasonably priced American Flyer Trains sets. Main line with 360 pulling 960,962,963. Tankers siting on siding. Boxcars and 740 Handcar sit in the yard. A 771 Stockyard on the right waits for a stockcar. 774 Floodlight Tower with a pre war Whistling Billboard and a 466 Comet with passenger cars.